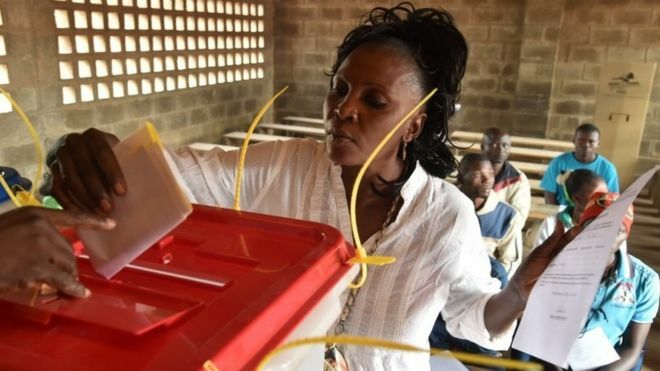 Bangui, Central African Republic – Voters formed in line across Central African Republic on Wednesday to elect a president, among 30 candidates, and a new parliament. Citizens hope the elections will end years of violence between Christians and Muslims in which thousands of people have died. After 3 years of violence, more than 1.8 million people registered to vote began casting ballots in what is the biggest hope to reunite the country after a largely Muslim alliance of rebel groups known as Seleka overthrew President Francois Bozize in 2013. After that, in 2104 a civil war between the Christian anti-Balaka militia against Muslim civilians that killed nearly 1 million people was unleashed. Rebels dropped their threat to disrupt voting in areas they control. Credit: BBC News. Lines began forming shortly after sunrise in the capital Bangui and in other areas of the country along with United Nations peacekeepers standing at polling booths, with security heightened in Muslim and Christian districts across the capital. The elections, which were delayed several times this year, went through the day without violence with delays reported in several districts because of logistics mistakes. There were a few problems, with some names of candidates for parliament reported missing from ballots. Even though it is not clear how many people showed to vote National Electoral Authority spokesman Julius Rufin Ngoadebaba said voting lines were moving until the final hours. He also declared that there had been enthusiasm for this vote and that Central Africans had come out en masse. Ahmat Abouna, a voter who fled to the Cameroon border town of Garoua-Boulai and voted along with thousands of other refugees said he had been dreaming of this election for two years since the day armed men killed his father and his brother in Bangui. Jean-Pierre Ondouga, 28-year-old shop owner said their priority is to have a new impartial president who can reunites Central Africans and gathers the pieces of all what they had lost during all these years. Among the list of 30 candidates, there are Interim President Catherine Samba-Panza, who held office since May 2014, former prime ministers Martin Ziguele, Anicet Georges Dologuele, and Abdoul Karim Meckassoua, a former foreign minister under former President Bozize. The results are not expected until next week, and a second round of balloting is scheduled for January 31st and in the absence of opinion polls, analysts were unsure who would emerge victorious.